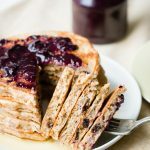 Although most mornings I wake up with a ravenous appetite for an exciting breakfast, the reality is there are days when I just wake up hungry, but wanting something very simple on the tastebuds. 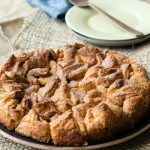 When I get into one of those moods, most recipes will sound too sweet or too oily or too heavy, but I still want to eat. So what’s a person to do? 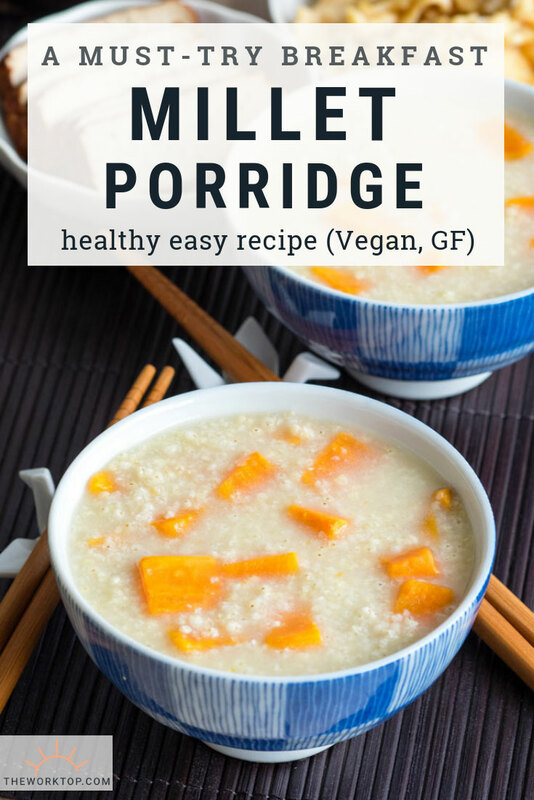 My answer to this simple breakfast craving is Millet Porridge with Sweet Potatoes! Nondescript mornings still need a proper start, and I manage this through a simple, versatile and healthy millet porridge. Millet porridge is served warm (not hot and not cold) so it’s a breakfast that satisfies any weather and season. Millet porridge can be made either as a runny or thick porridge. I like mine runny enough that it pours off a spoon, but thick enough that you can see the millet poking out the surface. It is so easy to make with only 3 ingredients, that even if I’m not motivated expend too much energy in the kitchen, this Millet Porridge with Sweet Potatoes is easy enough to make that I don’t hesitate to throw it on the stove. 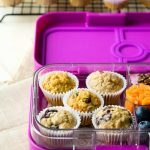 You technically could make it with just two ingredients too – leave out the sweet potatoes and add in your own choice of flavor. But I love it with the sweet potatoes, so I always add in a few chunks. Millet breakfast porridge is also flexible because you can dress it up to be either savory or sweet. 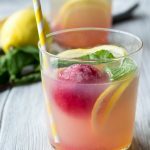 The base flavors are so flexible. Millet porridge doesn’t have much inherent taste, but it is a little nutty, and as an interesting texture that is not as mushy as oatmeal. In that vein, millet porridge makes a great alternative to oatmeal. 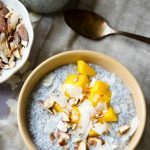 The sweet potato adds a bit of natural flavor and sweetness to this otherwise simple millet breakfast porridge recipe. You can definitely leave it out, and use this recipe to make a clean bowl of millet porridge. But I always add in sweet potatoes to my millet porridge, because they add a bit of color and texture to an otherwise bland (but oh so comforting) dish. 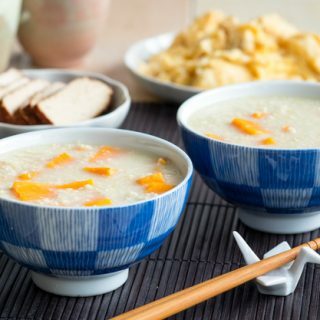 Millet porridge is popular in Chinese cuisine, and is called xiao mi zhou. 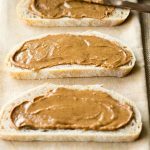 You can have it have it for breakfast, lunch or dinner, and simply change up the toppings depending on the meal. It can even serve to replace rice at a meal. 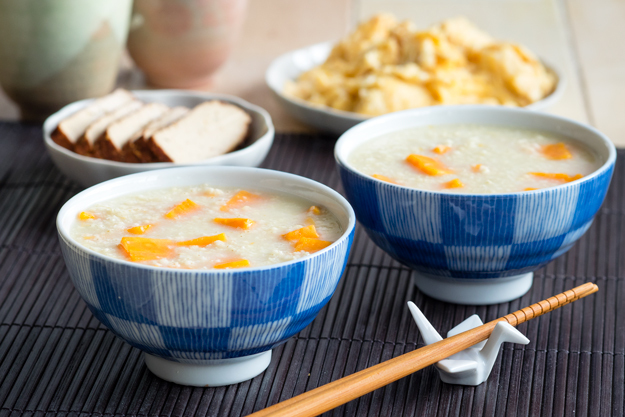 In the photos, I serve this millet porridge with Chinese style toppings. 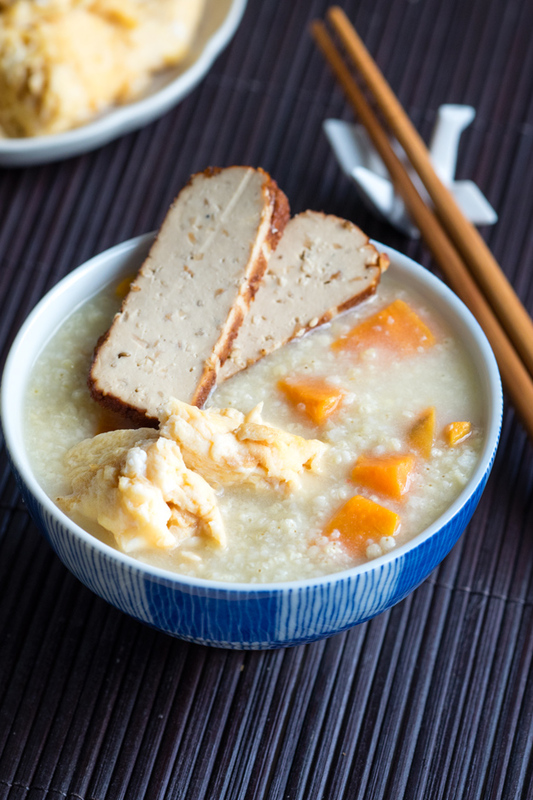 You can pair your millet porridge with a smattering of Chinese side dishes, but I chose smoked tofu and soy sauce scrambled eggs because they are quick to prepare, high in fiber and protein, and vegetarian friendly. 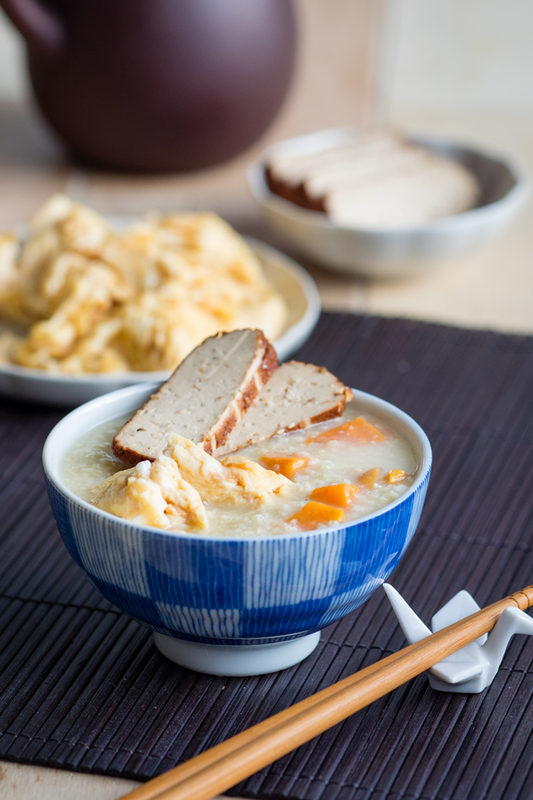 If you want to add some meat or more flavor, try serving your millet porridge up with some dumplings on the side, or Chinese pickled vegetables. 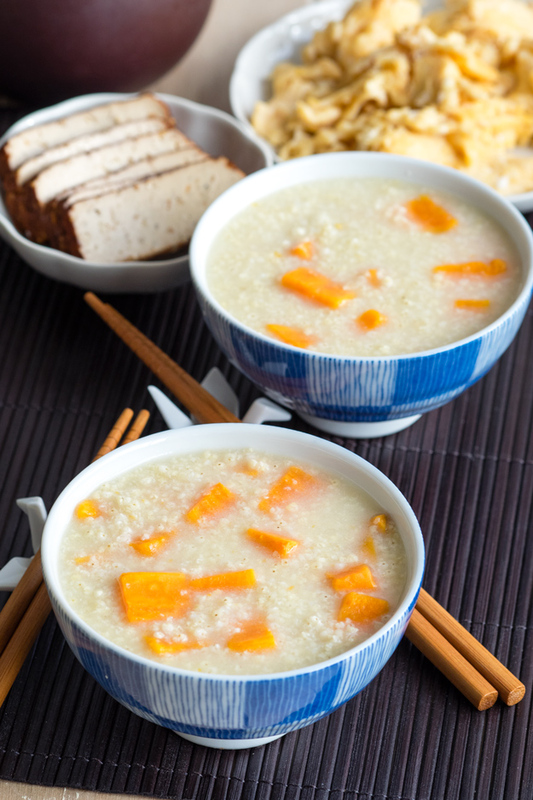 But you don’t have to limit yourself to Chinese side dishes for your millet porridge. You can top your Millet Breakfast Porridge with Sweet Potatoes with some cinnamon and maple syrup for a simple sweet breakfast. A fried egg would also work beautifully with this breakfast porridge. 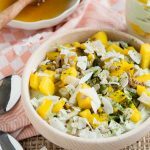 Millet porridge is a comforting breakfast recipe that I’m sure you will enjoy when you are looking for a simple recipe that is easy on the tastebuds. This comforting Millet Porridge with Sweet Potatoes is perfect for a simple breakfast. 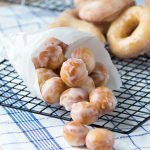 It's easy to cook and gentle on the tastebuds, making it the perfect breakfast when everything else might just sound too sweet, too oily, or too heavy. In a small saucepan, add the millet and the water and bring to a boil. Turn down the heat, and simmer uncovered for 20 minutes, stirring occasionally. It will seem very watery at first, but it will start to thicken at the end. After 20 minutes, stir in the cubed sweet potatoes and continue to simmer for an additional 30 minutes, until the sweet potatoes are softened and the porridge starts to thicken. Remove from heat and allow to cool for 5 minutes before serving. The porridge will continue to thicken as it cools. The amount of water can be adjusted to your preference. If you prefer a more watery porridge, add up to 2 additional cups of water. 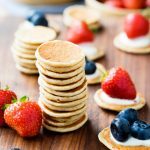 Looking for other comforting breakfast porridges? I love this simple, nutritious and gluten-free breakfast. In the fall you can use pumpkin instead of sweet potato. 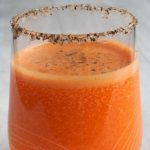 Hi Tammy, that’s a great idea to use pumpkin for the recipe! Thanks for sharing! Hi, Tina, Don’t say that you have your porridge with those chopsticks? how can you use them?